Ducati previews its anticipated 2013 range by revealing several new Multistrada models — the bike known for being the most versatile and long-range rider in its performance line-up. On the Multistrada the Italian motorcycle builder introduce several new features including a second generation Testastretta 11° engine, the very latest ABS, updated aesthetics, and, on the “S” versions, the innovative semi-active suspension system called the Ducati Skyhook Suspension (DSS). 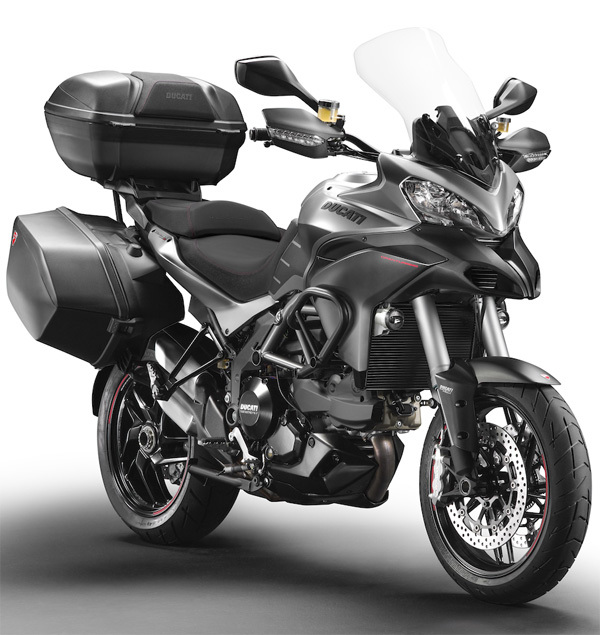 The new touring flagship of the range for 2013 is the Multistrada 1200 S Granturismo (above) outfitted with increased side luggage capacity, top case, additional LED illumination, enhanced wind protection and long-distance tires, while the enhanced Multistrada 1200 S Pikes Peak (below) celebrates the sporting side of the model’s character with a replica of the famous 2012 mountain race bike in its signature Ducati race-winning livery. The Multistrada’s award-winning Sport, Touring, Urban and Enduro electronic Riding Modes enable a highly customizable riding experience separated by just one click of a button. The four-bikes-in-one concept makes instant adjustment to power and torque delivery in addition to electronic adjustment of suspension settings, traction control, and now ABS and DSS, instantly transforming the Multistrada 1200 to suit its rider and environment with even more precision. The 2013 Multistrada range’s first public showing will be at the INTERMOT motorcycle show in Cologne, Germany from October 3-7, and will hit Ducati’s dealer network starting in December. UPDATE: The ID Agency put together this video of Ducati’s record breaking run at Pike’s Peak on the Multistrada, so we’re adding it to this post. As they write:”This year, our video production crew set out to capture Carlin Dunne and Greg Tracy on the 2012 Ducati Multistrada 1200 S during their record-setting attempts through 156 turns and ending at over 14,000 feet of elevation. After a few days of testing and tuning, Carlin Dunne managed to take the pole position and also set the new course record for motorcycles with a time of 9:52 while Greg Tracy posted a second place time of 9:58.